Close, but no cigar. EXP 350's efforts fall just shy of depth goal due to broken camera. The loss of our fibre optic link with the sub-marine camera, and the impact it has had on our expedition, illustrates the importance of this technology, but the wider importance of fibre optic technology is that it carries 95% of global communications, leaving satellite communication well behind! Most people have little or no idea of this, imagining that satellite technology is better, quicker, more modern and higher tech – it isn’t! 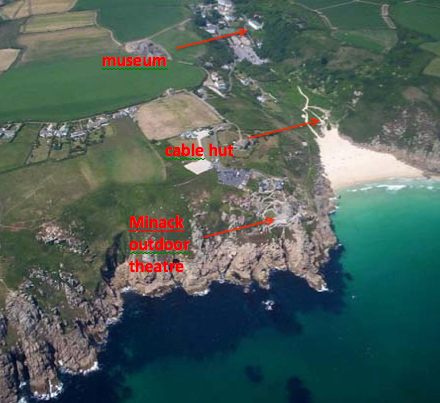 Some years ago I had the good fortune to work at Porthcurno Telegraph Museum in Cornwall, UK. It is a place that few people know of and even fewer have visited. It is in a tucked away (and exceptionally beautiful!) corner of Cornwall, not far from Land’s End where the most westerly tip of mainland Britain, comprising majestic granite cliffs, kicks it toe defiantly into the roaring Atlantic as if striding out towards the United States. Porthcurno holds a unique place in the history of global communications. From 1870 to 1970 it was the largest global hub for cable networks in the World. The first ever successful deep sea communication cable was laid across the Atlantic Ocean from Southern Ireland, in 1866, and without satellite or radio technology, signals were sent by flags between the ships! There is still a set of flags on the bridge of the Joides Resolution even today but now they are only used for ceremonial purposes. Shortly after this, Porthcurno was chosen as the ideal place to land the cables because of its unique geographical position, its deep, soft, white sand (ideal for burying cables as they leave the shore), and the fact that the land-based cables could then be buried all the way to London. There is a small hut near the beach where you can see the ends of the original twelve cables arriving from around the World, and the Victorian telegraph station, now the museum, lies further up the valley. The early cable laying ships were the first to do any deep sea surveying at all and it was the HMS Challenger that discovered the Mid Atlantic Ridge whilst surveying for a new trans-Atlantic cable route in 1872! This is an interesting conjunction with the work of the Joides Resolution that is part of a continuous investigation of sub-sea features ever since! The original cables were copper, but when fibre optic technology arrived the receiving technology was changed accordingly. Now, on top of the hill behind Porthcurno valley, concealed behind hedges, there is a huge receiving station handling almost unquantifiable amounts of data every day from around the globe. If you are in the UK, this page that you are reading could have streamed through that very place on its way from the US to your computer terminal! Because light travels faster than anything else we know, and because the glass used for the hair-thick fibres is so pure, cable communication is the fastest system known, certainly it is faster than satellite alone. It is also much less liable to disruption since radio frequencies to satellites can be interrupted by sun-storm or other cosmic activity, atmospheric conditions, and either incidental or purposeful interference from other radio-based broadcasts. When I use the ship’s telephone system, the signal leaves the ship via satellite on its way to College Station (TAMU) in Texas and is then transmitted back to the UK. Most people would assume that this process is all done by satellite link, but they would be wrong. A large part of this journey is made via these undersea communication cables based on fibre optic technology that is more up-to-date, quicker, and just as technologically sophisticated as satellites. Even your mobile phone messages spend a good part of their ‘travels’ going through underground or undersea cables as they travel between your local receiving mast and the transmitting mast at the other end! Any oceanic activity has to take the cable networks into account. Accidentally cutting through an undersea cable could cause the loss of communications to possibly hundreds of thousands of individuals, businesses and even governments. These accidents have been known to happen due to fishing, trawling or drilling, but also by mass movement of undersea sediments (underwater landslides, also known as turbidity or density flows) and in times of international conflict, cables can be purposefully cut by opposing forces! When the Joides Resolution arrives at a drilling site, the seabed has to be surveyed to make sure that there are no cables in the vicinity of the new hole. While the position of the cables is fairly well known, they can be moved by strong undersea currents or density flows, so final visual checks do need to be made. To do these checks the ship maneuvres from the potential drilling spot in a series of increasingly large squares – an ‘expanding 25m square’ – until they have covered the required area – in the case of our first hole this was a 100 metre square – which we are heading back to now. The size of the square depends on the likelihood of there being cables in the vicinity – the higher the risk, the bigger the square. During this operation the undersea camera is suspended below the ship, supported on the drill string which is just short of the sea bed, and the continuous images stream back on board ship via optical cable, carefully watched by the teams above. Now, towards the end of our trip, final reports and data sets are being streamed off the ship by satellite at the beginning of their trip to Texas which will undoubtedly be via a Pacific cable from Japan to the US, possibly going through a cable station in Hawaii on the way! So, while satellites are undoubtedly invaluable for navigation and communication on land and at sea (GPS and phones), fibre optic technology is actually far more important to global connectivity, but neither one would be an effective force without the other. I don’t have room here to explain how fibre optics, internal reflection, amplifiers, multiplexing and polarization work, but the science is really fascinating and well worth a bit of internet research time. And don’t forget that while you are browsing, the signals are streaming through cables at over 100 petabits per second – that is 100 x 1,000,000,000,000,000,000 light pulses per second! Now that really is cutting edge technology at its best!